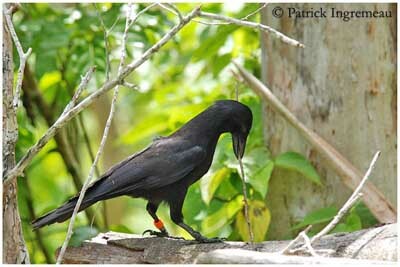 "The New Caledonian Crow is endemic to New Caledonia. It is able to use tools (made with leaves of “pandanus” or twigs) in order to extract coleopteran larvae from the wood cracks (between other facts). The behaviour of this bird is studied on Maré Island by a research team of the University of Auckland in New Zealand. We can see here the bird using a twig to reach pieces of meat hidden in holes in deadwood trunk. This bird is not captive, but it is ringed only to differentiate it from the others. Thank you to Russel, Alex and Felipe for allowing me to accompany them in the fields, in order to take these pictures." Adult has glossy black plumage overall. On the upperparts, feathers show purple, dark blue and sometimes green iridescences according to the light. Head is glossy black too. It has medium-sized and slender body, giving it long silhouette. Black bill is relatively long and conical, slightly chisel-shaped at tip, with angled up lower tip. Eyes are dark brown. Legs and feet are black. 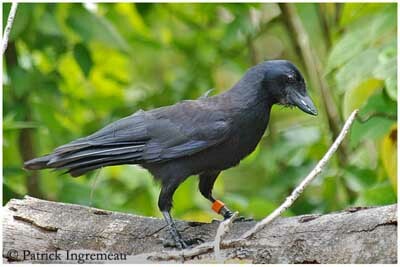 New Caledonian Crow is locally common in its range, and its populations are stable. This species could be threatened next day by clearing and degradation of New Caledonian forests. New Caledonian Crow utters two kinds of sounds: a hoarse “waaaaw”, and soft “waa-waa” or “wak-wak”. 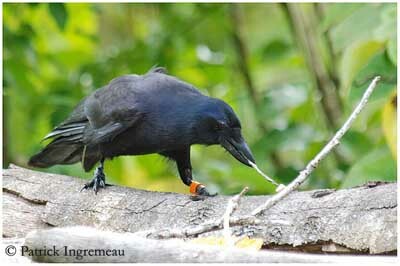 New Caledonian Crow lives in primary forest containing large trees, live and dead, and logs. It is also found in savannahs. 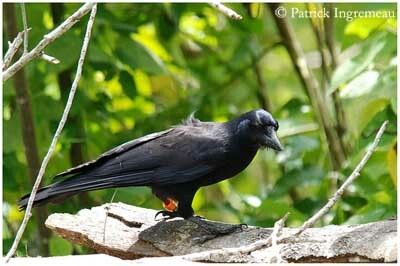 New Caledonian Crow lives in New Caledonia and in the Loyalty Islands, and it has been introduced in Mare Island. 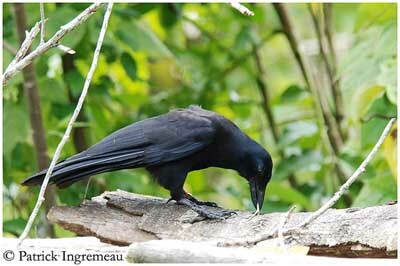 New Caledonian Crow feeds on wide variety of food such as flying and terrestrial insects, invertebrates, eggs and chicks, snails, nuts and seeds. It is known to invent and use tools, in order to reach all kinds of preys. It can use different plant material for creating hooks, or barbs. It collects sticks or twigs, according to the use. Sticks or twigs are used to extract grubs or other mollusc or insects from deep crevices in bark or wood, or from narrow holes. If stick is not adapted, it can create a hook or a barb with metallic wire, bending one side by wedging one end under something and then, grasping the food with this hook. 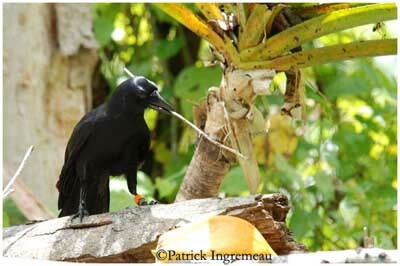 New Caledonian Crow makes other type of tools with the long barbed edges of leaves of “pandanus”. With its bill, the bird cuts and rips along the leaf edge, in order to tear out neat strips of several shapes, such as narrow, wide, and the last with one wide end, and the other being narrower. Each type of tools is used in different ways, to grasp something in narrow hole, to reach food in difficult place or too far, to take something in a corner… They can reach almost all they want, creating the right tool for that. 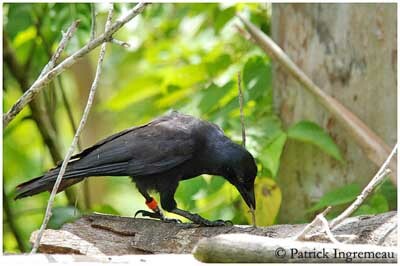 But New Caledonian Crow can also feed by catching insects in flight with ease. It also feeds on snails, using the typical method which consists of dropping the snail from a height onto hard surface in order to break the shell. 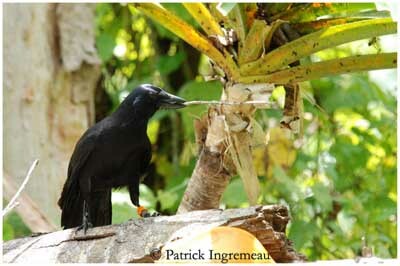 New Caledonian Crow is able to reach numerous kinds of foods, showing unbelievable ingeniousness in several cases. It feeds in pairs or in family groups, sometimes in flocks of up to 30 birds. New Caledonian Crow has agile flight, allowing the bird to catch insects on the wing. In order to escape from its natural predators (raptors), it flies with litheness through the shade of the trees where its dark plumage makes it invisible. Breeding season occurs from October to February. 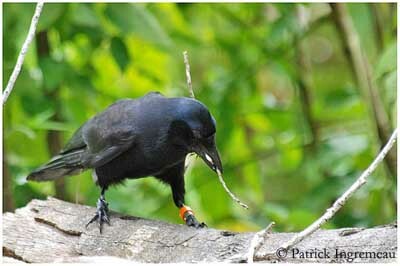 New Caledonian Crow nests in trees, between 3 to 10 metres above the ground. Nest is a thick platform made with sticks, and just above, the cup is built with twigs. Female lays 1 or 2 blue eggs, with dark markings. Incubation is shared by both parents. Chicks are fed by adults during nesting period (unknown) and for 4 to 5 months after fledging. 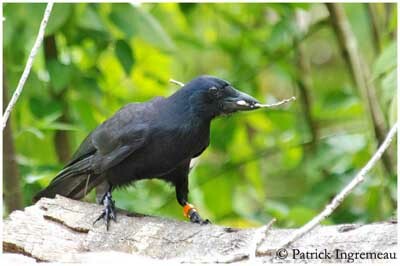 New Caledonian Crow feeds on terrestrial and flying insects and other invertebrates, molluscs such as snails, worms and slugs, reptiles such as small lizards, eggs and nestlings, nuts and seeds. It searches for food as well on the ground or in flight, and it is able to create and use several kinds of tools, in order to reach preys.